You’ve probably heard all about pressure washing and the benefits it has for a business, but what about your home? What is pressure washing and why would it benefit your residence? Pressure washing will remove loose paint, mud, grime, dust, and mold, from concrete areas, vehicles, homes, and buildings. At ProClean Windows, we offer pressure washing for residences and businesses. Pressure washing will make your home look better and remove all of the debris that might clog certain areas. ProClean Windows is a window washing company located in Sandy, UT, that specializes in making your commercial windows or residential ones clean and look good as new. Check out some of our services to see what would benefit you. The value of your home can go up or down depending on how well you take care of it. If you don’t cut your lawn, allow the paint to chip, and don’t take care of the house, the value of your home will go down. Value your home because you’ve put a lot of work and energy into it. Your home is your sanctuary and you want to treat it the right way. In addition, putting value into your home will also make it sell better if you were ever to put it on the market. By pressuring washing your home, you are taking care of it and putting value into it. Pressure washing with ProClean Windows is affordable and will increase the value of your home because it is eliminating the dirt, debris, and mold that might have infiltrated your home. If you are planning on selling your home, pressure washing will also add to the value and raise the sale price a considerable amount. Family is precious and by taking advantage of pressure washing your home you’ll be able to protect them from getting sick. Pressure washing will eliminate the different contaminating substances that might have found their way into your home. Pressure washing will annihilate mildew, algae, dirt, and other substances that are life threatening and detrimental to you and your family’s health. 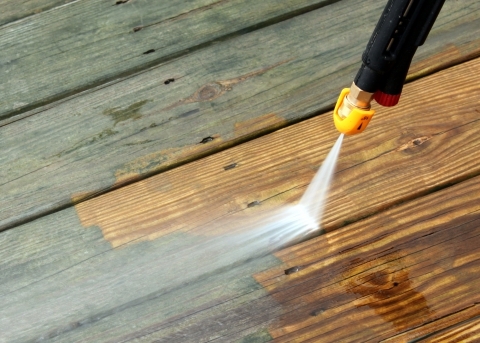 Pressure washing will also remove the bacteria from your driveway, walkway, patio, and porch. Keep the bacteria away by pressure washing and keep your family safe. Avoid injury and illness from bacteria. To find out more about pressure cleaning or our window washing services, contact a window cleaner today.